World Retina Week was observed in over 42 countries this year. The week kick starts Eye Care Awareness month in South Africa which ran from the 22nd of September to the 19th October. Thanks to Vision Works and spec savers Optometrists who sponsored free vision screening during the month. Thanks also to DSTV, ETV, Primemedia and all the radio stations who gave such generous airtime to our radio and TV ad. Thank you also to the magazines, radio stations and newspapers that published or broadcast Interviews and our press release. Thanks ETV for the live TV interview. Posters and awareness material was sent to clinics, doctors rooms, hospitals and Optometrists all over South Africa. Creating awareness of retinal blinding conditions is one of our prime objectives and staff and volunteers at both national and branches did extremely well. Congratulations. 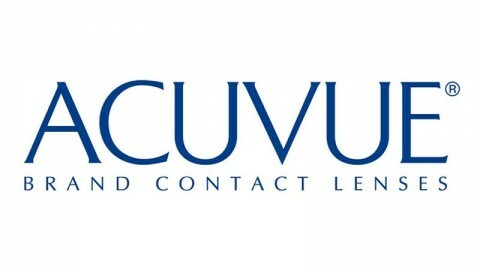 A special thanks to Bausch and Lomb who sponsored the courier costs of getting the material out to the entire country. The 27th Ride for Sight will be held on Sunday February 15th and we would like to thank Dis-Chem our naming sponsor and the City of Ekurhuleni for once again supporting this –our most important fund raising event of the year. We have managed to procure wonderful prizes which include holidays, Bikes, Vouchers, products – R 120 00 worth for the lucky draws but also over R100 000 for the donation draw. The donations from Cyclists are matched by the Dis-Chem Foundation and the 2 prizes on offer are a Trek bike worth R60K or a 7 night Holiday for 2 at the wonderful Michamvi Sunset Bay resort in Zanzibar. As ever the quantity, diversity and quality of the research into retinal degenerative conditions is staggering. We try to keep you abreast of the most exciting. Stem cells will in time provide the most promising avenues to regenerate photoreceptors and other retinal cells but IS NOT commercially available as yet. The number of patients who send us website addresses from remote facilities offering “cures” for RD is alarming. The only stem cell therapy in approved human clinical trials is the ACT trial to grow new Retinal Pigment Epithelial cells from embryonic cells- see below. Promising work using stem cells to grow photoreceptors is still in the animal model stage. Do not be tempted by false claims. Sheila Nirenberg continues her amazing work to improve the quality of vision delivered by a retinal replacement device. She and Chethan Pandarinath are incorporating the code normally used by the retina to communicate with the brain into a high-resolution prosthetic device. They have developed a device that uses an external camera system and an injected photo switch so no eye surgery is needed. The device dramatically improves the quality of vision in mice models. In normal retinas, the visual signal is translated into different patterns of electrical pulses as it passes from one cell to another and finally via the ganglion cells to the optic neural pathway that communicate with the brain. They discovered that the code that directs this series of translations and built a device containing an encoder that translates the external visual world into patterns of electrical pulses similar to those produced by the normal retina. In blind mice, ganglion cells stimulated by this method fired correctly nearly 90% of the time. Mice were able to discern facial features and visually track an image. It is hoped that these findings will lead to the development of a highly effective retinal prosthetic device for humans. For a short video on her work see-http://www.macfound.org/fellows/899/. University of Pittsburgh School of Medicine researchers have been awarded $1.25 million from the U.S. Department of Defense (DOD) to fund two projects that aim to establish the groundwork for the nation’s first whole-eye transplantation program. This innovative research could ultimately lead to critical discoveries or major advancements. The Pitt researchers will lead a multidisciplinary consortium that includes clinicians and scientists from Harvard University and the University of California, San Diego. Whole-eye transplantation has remained an unrealized goal in vision restoration because of challenges related to immune rejection and reestablishing the extremely complex connectivity of the optic nerve to the visual centers in the brain. The Audacious Restorative Goals in Ocular Sciences (ARGOS) Consortium established at Pitt will be the first cross-disciplinary, systematic attempt to explore strategies to enable corneal regeneration, retinal cell survival, longdistance optic nerve regeneration with cortical integration and whole-eyeball transplantation. The Implantable Miniature Telescope has been available in Europe and USA for some time. An improvement on this device, that is incorporated into an intraocular lens, is now available in Europe. The new device uses 2 lenses configured in a Galilleo type assembly to give better Visual Acuity and uses a smaller incision. The cost of the device is around R28000 and has been awarded the CE mark. It is usually used for patients with dry AMD where the visual field just outside the macular area is quite stable. See www.iolamd.com. Reports published in the Lancet recently indicate that the ACT trial to replace Retinal Pigment Epithelial cells grown from Stem cells is showing promising results. New RPE cells were transplanted into 9 patients with Stargardt Dystrophy and 9 with Dry Age Related Macular Degeneration. All 18 were followed for three years and researchers saw no signs of rejection of the cells and no abnormal growth, tumor formation or unwanted tissue types in any of the patients during that time period. On average, the vision of the patients improved about three lines on the standard eye chart. A worldwide assessment is being undertaken to evaluate patient groups, patient statistics and clinical and genetic capacity in countries for possible inclusion in this gene placement therapy for Stargardt Dystrophy. We were included in the survey and this has revealed a massive lack of feedback from patients to Retina South Africa. If you have a genetic result please do not assume that we received a copy. Your results are confidential but without a copy we cannot adequately represent your interests. PLEASE send us copies of your genetic results. As always this information will not be divulged to any 3rd party without your consent. 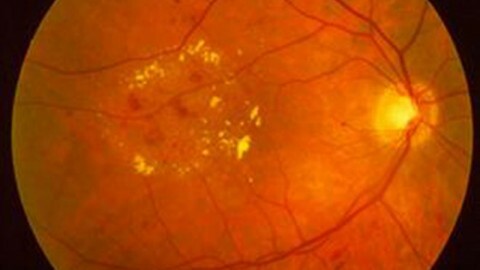 X-linked retinitis pigmentosa (XLRP) caused by mutations in the RPGR gene is a severe and early onset form of retinal degeneration, and no treatment is currently available. Recent evidence in two clinically relevant canine models shows that adeno-associated viral (AAV)-mediated RPGR gene transfer to rods and cones can prevent disease onset and rescue photoreceptors at early- and Mid-stages of degeneration. It is hoped that this success in an animal model will soon lead to human clinical trials. Time flies when you are learning the next generation of scientific techniques! As my research visit in the USA comes to an end, I can hardly believe that I have been here for three months. I arrived in Bethesda, Maryland, at the end of August with carefully selected DNA from families with vision loss due to inherited retinal degenerative diseases (RDD) from our UCT Human Genetics RDD registry. I have been working at the world-renowned Neurobiology Neurodegeneration and Repair laboratory, in the National Eye Institute at the National Institute of Health (NIH), with our collaborator Prof. Anand Swaroop. This research involves performing Whole Exome Sequencing, where we capture and sequence the entire exome (which is the coding portion of the human genome and therefore most likely to carry disease-causing mutations). This work is part of our current approach to focus on indigenous African families with RDDs, and the particular DNA samples that I have used were selected because we believe they represent the greatest chance of new and exciting findings. We have observed a low rate of mutation detection in patients of indigenous African origin over the past 25 years of our research at UCT, hinting at novel genes and mutations in this population. I have spent the majority of my time in the USA learning this exciting new technique and doing the experiments, and the next challenge will be wading through the huge amount of sequencing data that has been generated: looking for those few important retinal disease-causing mutations, which are hidden like needles in a haystack of genetic variation. Our greatest treasure as Human Genetics researchers in South Africa is the diversity of our South African population. Prof. Swaroop’s laboratory has highly skilled researchers, experienced in this Next Generation Sequencing analysis, and the equipment to perform this exciting research. We are hopeful that working together will give us new insight into the genetics underlying RDDs in South Africa, and possibly the rest of the world. After 3 months I am hardly an expert in Whole Exome Sequencing, but I have already learnt so much and am eager to share this knowledge with my colleagues in South Africa. I am grateful to Professors Raj Ramesar, Jacquie Greenberg and Anand Swaroop for this opportunity. I am also very thankful for all the efforts, support and enthusiasm of the Retina South Africa branches across the country, who helped prepare the study cohort, and am indebted to the thousands of South Africans with vision loss who participate in our research project. This has been a wonderful opportunity and is certainly a highlight of my 15 years working on the RDD project at UCT. UPDATE – Stem cell disease- in- a- dish project on RP13. Many patients are not aware of the steps that they should be taking to ensure that they manage their RD as much as possible. 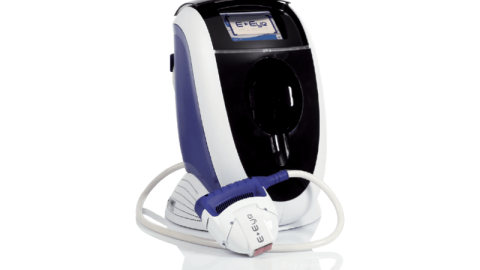 An ERG which measures the electrical impulse of the retina and is a definite diagnosis of a retinal condition. An OCT which takes a scan of your retina [the image resembles a green sandwich] which gives a clear image of retinal damage. An SLO with adaptive optics. The scanning laser uses space age technology to give a remarkably detailed image of the retina and even underlying cell structures. A Fluorescein Angiogram, with or without Autofluoresence. This is especially helpful in Macular degenerations and dystrophies. Join Retina South Africa. We have trained counsellors to give you support and refer you to service providers. We can give you advice on risk factors, adaptive technology, nutrition, careers etc. We are the only NPO dedicated to finding treatments for retinal conditions. Send us a copy of your results. UCT and genetic counselors cannot do this without your express permission. Register at www.myretinatracker.org to ensure that you are accessible to researchers looking for specific patients. Get involved. Clinical trials and treatments will soon be a reality. Now more than ever we need to strengthen our Genetic Patient Services Project at UCT. We need your help to do this. 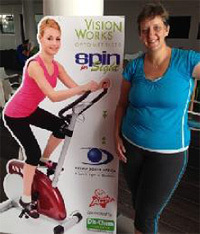 3 Successful Spin for Sight events were held recently – In Port Elizabeth, Little falls and K90, Boksburg. Retina South Africa would like to thank Vision Works and Virgin Active Health Clubs for their wonderful support of these events. Thanks also to George Levin [Vision Works] for his passion and vision which is the driving force behind these successes. Thanks also to the Virgin Active instructors who gave their time so freely and helped in the marketing of the events. 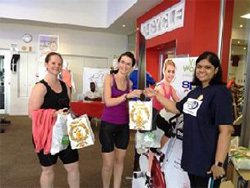 [Sayuri Chetty [right] Vision Works Strubensvalley handing prizes to Monika Croll and Adele Wybourn who spun for 3 hours each in Little falls. To all the spinners who supported us – thank you and well done. Thank you to Dis-Chem pharmacies for sponsoring the goodie bags given to every spinner. It is hoped that the event will ‘spin out’ to become an annual event at more centres. Little Falls are already organising their next event. 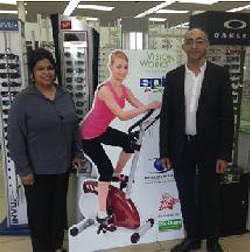 Manoj Raga [Vision Works , Port Elizabeth] handing over the fantastic R15 000 cheque to Gail Cillie [RSA] from the PE Spin for Sight held in held in August . Zai Alli and Solly Moosa Vision Works Boksburg who organised the K90 event. RETINA SOUTH AFRICA WC USES WORLD RETINA WEEK TO CREATE AWARENESS. The newly elected board of Retina South Africa Western Cape enthusiastically grasped the occasion of World Retina Week and National Eye Care Month to kick start their awareness campaign around the work of Retina South Africa and our SMS fundraising campaign. Starting with an interview on Radio Helderberg, Chairperson Manny Moodley; our Director for Science, Claudette Medefindt’, was interviewed on Bush Radio, Radio CCfm, Voice of the Cape, Radio 702, Classic FM and Radio Tygerberg. A stream of community notices appeared on Heart 104,9 and Good Hope FM. The campaign not only created awareness around the free eye tests offered by Spec Savers and Vision Works during National Eye Care Month, it also informed the public about our organisation, the advances in research for Retinal Degenerative Disorders and the work of Retina South Africa. Manny and Claudette must be congratulated at the admirable way they handled the media, especially as they often had to avail themselves at short notice. The stage has now been set for the Western Cape Branch to continue with their awareness campaign which will only add value to our fundraising efforts. Celebrate the festive season by giving generously to Retina South Africa’s projects to bring clinical trials and treatments to South Africa: SMS “Dream”to 38267, sms costs R10. Nominate us as a beneficiary on the My School/ My Planet Woolworths initiative. No charge to you- enroll all your friends and family. Join our Circle of Light for just R240 per year and be in line to win a monthly prize of R500. This has really helpful information from other consumers. Magnificent – an excellent free magnifying app is also available from the app store- search magnificent. This is truly the best mag app that I have tried- split or single screen, black and white or colour, add light, reverse camera, upgrades at a cost, but basic package is free. This was developed by our member Ferdie Danzfuss- Congrats Ferdie. Jaco Kruger is a tax consultant specialising in Disability tax. Many tax payers and parents are unaware of the tax deductions that they are eligible for. Contact Jaco for a freeconsultation- Cell no: 083 636 9991 or Email: jaco@accfinser.com. Jen and Ken are avid birdwatchers but Jen’s AMD does not allow her to see clearly. After consultation with RSA, Jen was advised to explore the use of sun protective eyewear and sunhat when out bird watching. 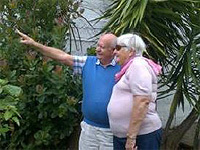 Hubby Ken received training on being a sighted guide and now is able to help Jen identify the birds on outings. It has been an interesting and exciting year for me working for Retina SA East Cape Branch. Before joining Retina SA I had no experience working with RD patients and no idea of what to expect. I simply took one day at the time learning every day and the welcoming environment made it easy for me to ask for help when needed. Every project has taught me so much about myself as a professional, my community, retinal diseases and most importantly retinal patients. 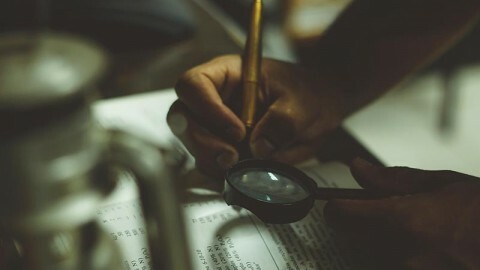 The most challenging part of my job was tracing patients who had changed their contact details, even though I enjoyed playing the “detective”, I became extremely frustrated when I did not achieve results. Going into the New Year, I am excited about being part of Retina SA East Cape Branch and to develop new programs that will empower retinal patients, their families and the community at large. 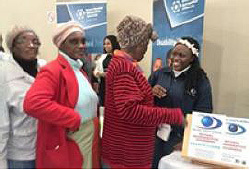 Yonela Hofu, [right] assisting members of the community at the NMB District Health Department – Annual Disability Awareness Day in November. Invitation to all partially sighted people in Ekurhuleni to come and play blind and Visually impaired bowls. The National Association of Blind Bowlers has a new Ekurhuleni region open. We will teach you how to play the game of bowls and have fun and meet people. and be involved in this great sport. Call Beppie 011 425 6576 or 073 005 4781. Gavin Kilpatrick [ Stargardt Dystrophy] has taken the world by the horns and achieved in both the sporting as well as academic fields. Beijing Paralympic Bronze Medallist for Track Tandem Cycling 2008, followed up with World Rowing Championship Bronze Medallist in South Korea 2013. He completed his sport communication degree and more recently Honours degeree in Sport management at the University of Johannesburg. Gavin has just joined the Cyclists Workshop in Randburg heading up the retail sales department. We wish him well and look forward to seeing him on his tandem at the 2015 Dis-Chem Ride for Sight. 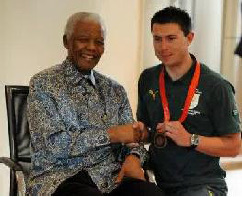 Gavin is pictured here with his bronze paralympic medal and the late, great Madiba. Assess the challenges or barriers encountered by graduates with disabilities when seeking and locating employment; Explore employers’ misperceptions regarding the employment of people with disabilities and to identify the existence, or lack thereof, of facilities and systems geared at supporting employees with disabilities at the workplace. The production and distribution of this newsletter is sponsored by Bausch and Lomb via an Unconditional educational grant to Retina South Africa. The views and comments expressed in the newsletter do not necessarily reflect the views of Bausch and Lomb. 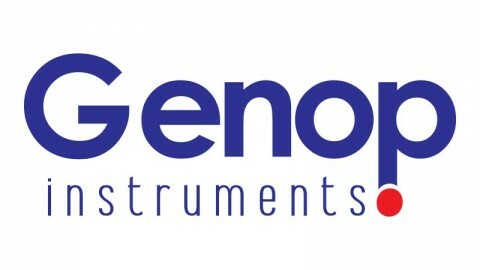 Genop celebrates 90 years in businessThe South African School Eye Health Project aims to screen 150 000 school children in three years!